Hendrik Antoon Lorentz (18 July 1853 – 4 February 1928) was a Dutch physicist. In 1902, he was awarded the Nobel Prize in Physics together with Pieter Zeeman for the discovery and theoretical explanation of the Zeeman effect. He also derived the transformation equations that were later used by Albert Einstein to describe space and time. 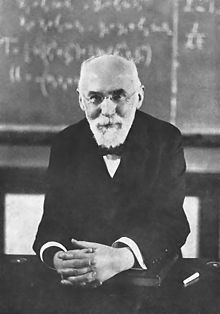 Hendrik Lorentz was born in Arnhem, Gelderland (The Netherlands), the son of Gerrit Frederik Lorentz (1822–1893). In 1862, after his mother's death, his father married Luberta Hupkes. In 1905, Einstein would use many of the concepts to write his paper entitled "On the Electrodynamics of Moving Bodies", known today as the theory of special relativity. Because Lorentz laid the fundamentals for the work by Einstein, this theory was originally called the Lorentz-Einstein theory. Lorentz was one of few scientists who supported Einstein's search for general relativity from the beginning – he wrote several research papers and discussed with Einstein personally and by letter. For instance, he attempted to combine Einstein's formalism with Hamilton's principle (1915). In January 1928, Lorentz became seriously ill, and died shortly after on February 4. ↑ Einstein, Albert (1905), "Zur Elektrodynamik bewegter Körper" (PDF), Annalen der Physik, 322 (10): 891–921, Bibcode:1905AnP...322..891E, doi:10.1002/andp.19053221004 . See also: English translation. ↑ Kox, A.J. (1993). "Einstein, Lorentz, Leiden and general relativity". Class. Quantum Grav. 10: 187. doi:10.1088/0264-9381/10/S/020. ↑ Kox, Anne J. (2011). "Hendrik Antoon Lorentz (in Dutch)". Nederlands Tijdschirft voor Natuurkunde 77 (12): 441. This page was last changed on 4 February 2019, at 17:53.